“A glance at the unknown” is a new book by Sangeeta Shankaran Sumesh. I had met the author only once before, during Budget Travel Unconference and known her as an avid traveler and a high profile corporate executive. Recently I noticed the announcement of her first book online and was keen to read it. My curiosity grew even further when I learnt that this book is an outcome of the book writing workshop held by Kiruba Shankar. Usually attending workshops do not result in immediate outcomes or benefits-not because the workshop was bad, mainly because participants get busy with their daily life and never get time to adapt the learning from the workshop or put their plan into action. But after Kiruba’s workshop, many participants did complete their book and publish it- speaks a volume about the effectiveness of the workshop and its curator. Back to the book, from its title (A glance at the unknown) its genre was not very clear, I wasn’t sure what to expect. With blank expectations, I started reading the book. First thing I liked about the narration is its usage of simple English. Occasionally authors try to show off using complex words and sentences, trying to demonstrate their command over language. This book is written in very simple language. Throughout the 165+ pages, I found just about 2-3 words that I didn’t understand. As I started reading, first 4 chapters had four different tracks, so for a moment I wondered if it is heading into a super complex plot. But from chapter 4 onwards the dots begin to connect and story comes together. The plot begins in cities but soon moves to the forest and tribal people. Core of the story seems to be about spirituality, finding answer to life’s problem and the right step forward. It is interesting to see how every situation can have totally different point of view or another side of the story. I have only given some pointers to help you decide if the genre is to your liking. You may please buy and read the book for full story. Personally I didn’t like the idea of crimes of one birth getting punished in next birth or the idea that we shouldn’t bother punishing the culprits as god will take care of it in their future births or that you are suffering in this birth because you did something bad in your previous birth. A girl who was raped and killed in the first chapter- in the end it was explained the she was son of village chief in previous birth and had raped many women in previous birth. As a punishment she was raped in current birth, by guys who were her victims in previous birth. This is indirect way of saying all the idea of law and order, courts etc are not required. It would have been lot simpler if each birth and death begins and ends with a clean slate. But then, while it feels like unfair, in some remote probability it could be true also- given that many culprits never get punished in their lifetime, we can only hope that they rot in hell and get punished in next birth. Also this was a smart way to take the story to a conclusion. 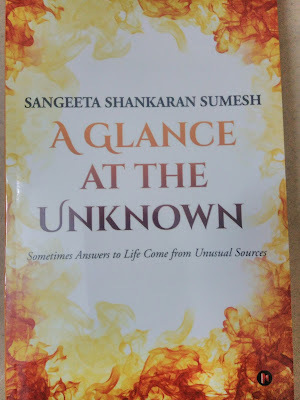 'A Glance at the unknown' offers lots of adventure and suspense along with a fair bit of spiritual gyan, little bit of romance and other things. Even if you don't believe in god/spirituality, do read the book- it gives some rationale explanation to life crisis we often undergo (tough marriages, failure in business/work etc). You may connect with the author through her FB page. I wish all the success to the book. Read my other book reviews here. Thyank youfor the awsome review blog...very creatively and formely introduce the 'A Glance at the Unknown' . I realy interested the very good this bood. I must buy the book and suggest my friends..keep sharing such a good post,thank you.